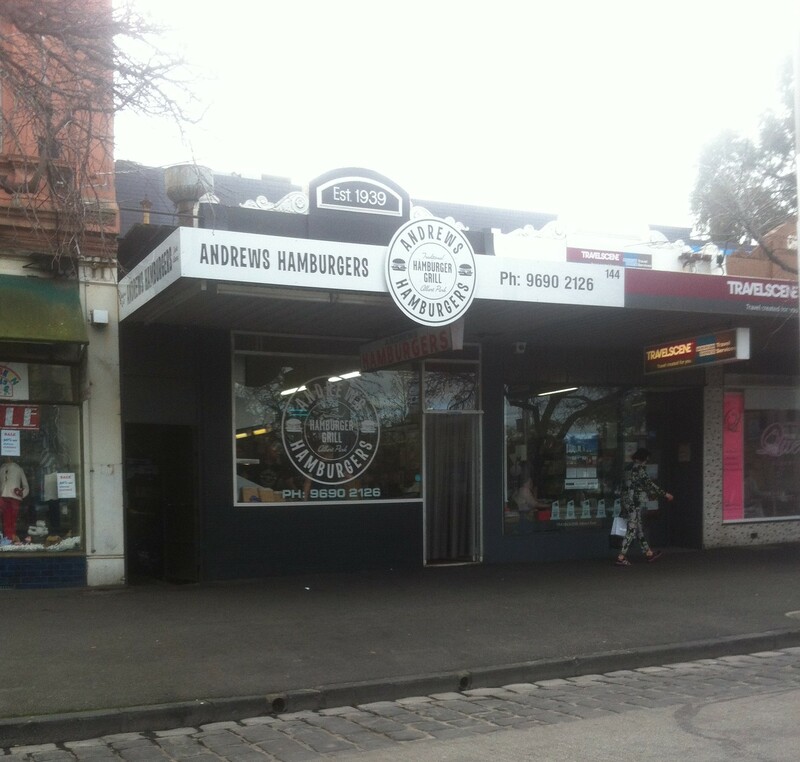 I wanted to check out Andrew’s Hamburgers because I’ve heard that it houses some of the best burgers in town and it was also briefly featured in this year’s Masterchef, so I wanted to see what the hype was all about and taste it for myself! I ended up making A drive me there to try it haha. The guy who served us was great; he knew his stuff and was happy to help us with the menu and gave us recommendations. The restaurant is more suitable for when you’re buying food to-go, as the place is terribly small with a capacity to seat around 8-10 people? 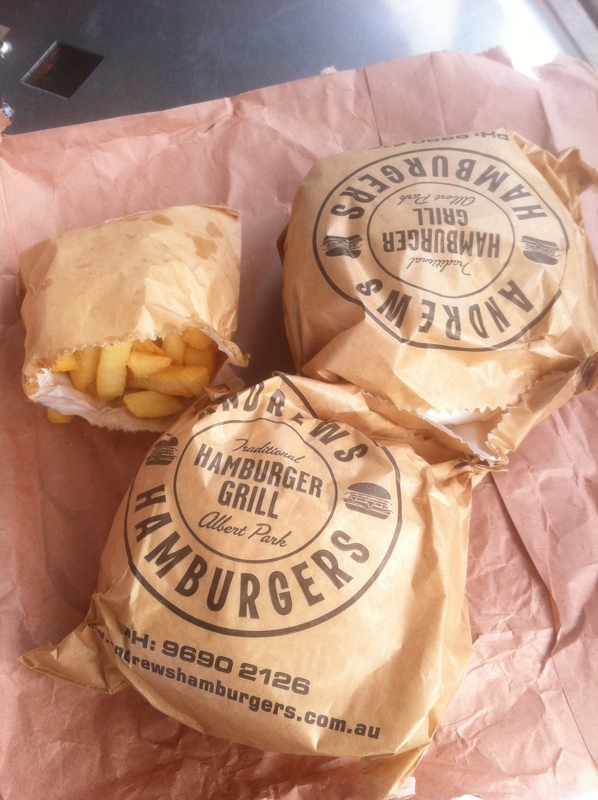 However, Andrew’s Hamburgers is at a great location, being about 4kms away from Melbourne CBD and a 5 minute drive from Albert Park so A and I decided to go to the park and eat there. Small chips ($2.50) – crispy and well-seasoned at a cheap and affordable price, however there was nothing particularly outstanding or different about these chips. Quite ordinary. Traditional Beef Burger w/ “The Lot” ($10.50) – beef pattie, lettuce, cooked onions, egg, bacon and cheese with hot chilli & BBQ sauce (excludes tomatoes). 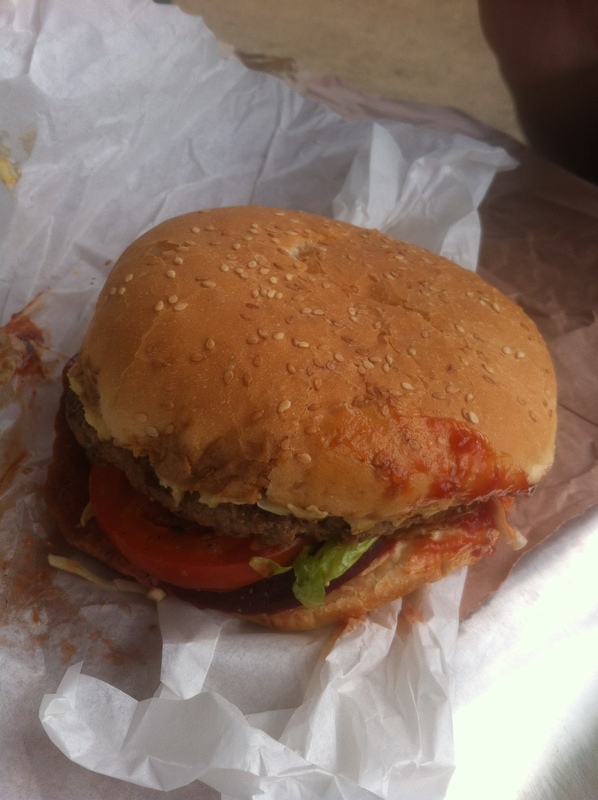 Traditional Beef burger ($9.50) – beef pattie, lettuce, cooked onions, tomato, beetroot, cheese with tomato sauce. I don’t get it, I am completely baffled. I seriously cannot see what the hype is all about with these burgers. The whole time, I was searching for something to wow my taste buds but I found nothing. It was just so mediocre… there was nothing unique about it that I couldn’t get at any other local fish and chip shop for practically the same price, if not cheaper. Your typical vegies and cheese with tomato sauce (which tastes the same as the ones you buy in a bottle at Coles) in between two average buns. My beef pattie wasn’t as juicy as I had hoped, they cooked it for a bit longer than the way I usually like it so it was no longer pink in the middle. They also didn’t add enough sauce into my burger so it was pretty dry. Food truck burgers are way better than this. I don’t know, maybe I just chose the wrong thing and should’ve tried the special or something, but I was definitely disappointed. 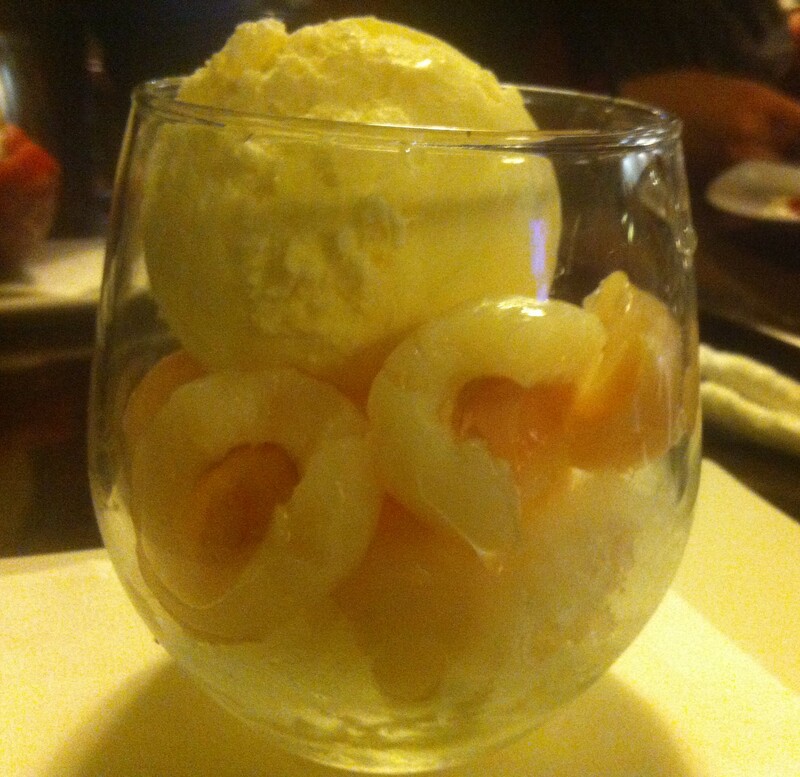 Later that night I went for some dessert with Keen Team (A, C, D and N) at Desserts By Night. The staff were passive; there wasn’t much of a greeting at the door and customers were expected to go up to the counter and order (despite the restaurant being empty and having about 2-3 workers at the time). Very lazy and sloppy service if I do say so myself. Desserts By Night looks great visually though, with a vintage patterned wall decal adorning the whole side wall, a fancy built-in fireplace on the other and elegant chandeliers illuminating the counter area. 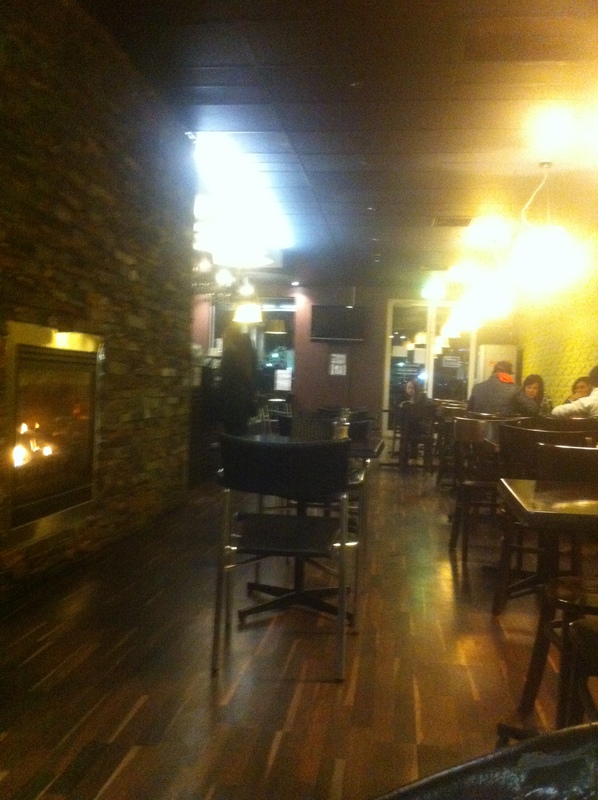 The place started off fairly empty and quiet, which set a relaxed atmosphere. However, the tables were filling up quite quickly and soon enough, it was pretty much packed after about an hour. Man when it was packed, the restaurant became SO loud; the sounds of rapid chitchat echoed the whole restaurant. Everyone was just trying to talk over all the noise, it was overbearing and I found it difficult to hold a conversation with my friends without thinking in my head ‘what did they just say?’, and that was when we left. 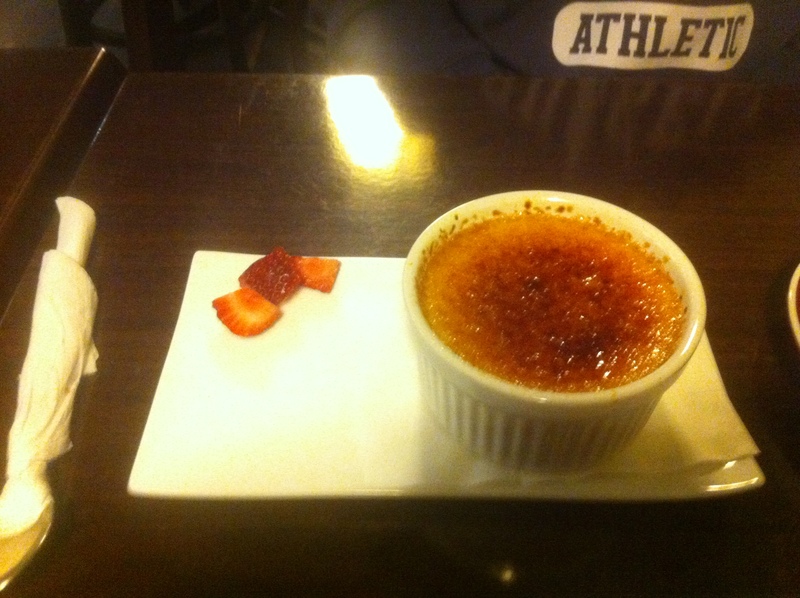 Crème Brûlée ($12.95) – traditional French custard with crispy caramelised crust served with fresh strawberries. 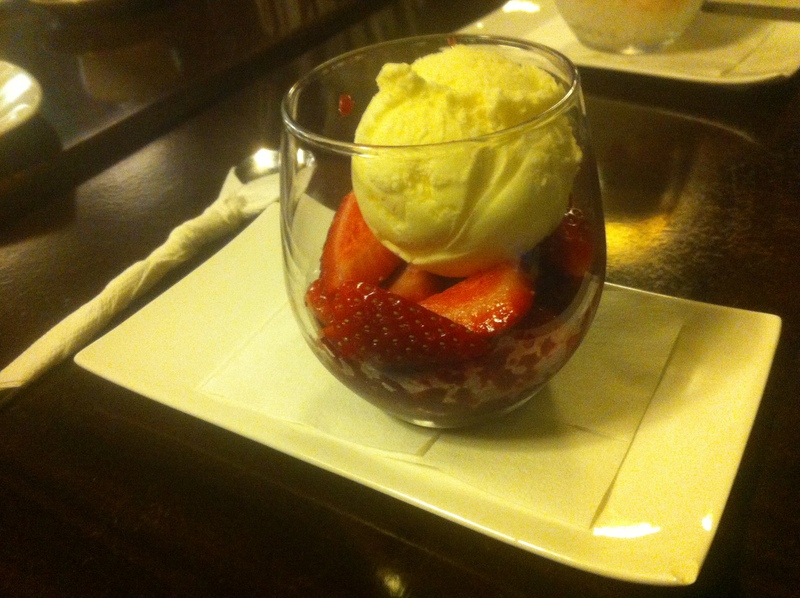 Mixed Berry Granita ($9.90) – Berry granita served with vanilla ice cream and strawberries. 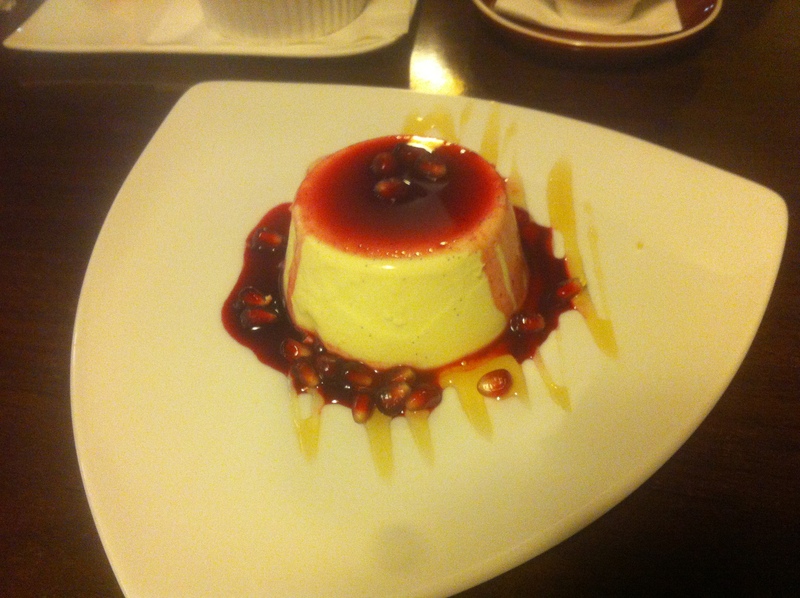 Panna Cotta ($8.95) – classic Italian dessert served with pomegranate syrup and honey. The panna cotta itself had quite a grainy texture, but still tasted great because it had a hint of sweetness. However the syrup and the honey completely destroyed the dish for me. The pomegranate syrup was incredibly sour whilst the honey was very sweet, both having very strong and contrasting tastes so it was a major clash in flavours. My taste buds went whack. I would’ve enjoyed the panna cotta just by itself with the pomegranate seeds, and with something more fresh such as fruit. Stay tuned, post coming soon!